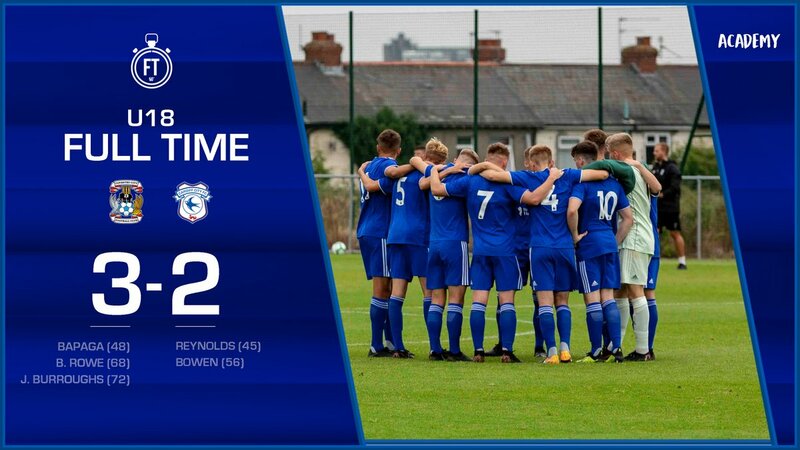 Craig Bellamy’s young Bluebirds led twice against their Sky Blue hosts in a 3-2 Professional Under-18 Development League defeat at the Alan Higgs Centre. Manager Bellamy made two changes to his starting line-up with Ben Margetson and Siyabonga Ligendza called up. Rudy Andrew-Knott, a 15-year-old attacking midfield player, was among the Cardiff substitutes. The former Southampton trainee joined the Cardiff Academy last summer after being released by the Saints. Ryan Reynolds and captain Sam Bowen scored for Cardiff, while Luke Rowe, Jack Burroughs and William Bapaga replied. Bowen had a chance to score a third for the Bluebirds, but his 79th minute penalty was saved. Isaak Davies went for goal from inside the penalty area after 27 minutes and goalkeeper Tom Billson had to make a smart save. Bowen shot wide from 20 yards five minutes before the break before Reynolds put the Bluebirds in front. Reynolds had treatment midway through the first half after he collided with Coventry’s Dylan Fixter, but he recovered and headed Cardiff in front during first half injury time. Bapaga equalised with 48 minutes gone, while Cardiff responded well. Kieran Evans almost restored their lead, but his shot was saved by Billson, and then Bowen finished clinically after 56 minutes. Coventry made it 2-2 after 68 minutes when Rowe fired home from a penalty after goalkeeper Ratcliffe had fouled the Sky Blues’ forward. Bellamy’s boys threw themselves forward again, but they were hit on a counter-attack when Burroughs fired home with 72 minutes gone. Cardiff could still have earned a draw, but Bowen’s spot-kick was pushed onto a post by goalkeeper Billson before Margetson’s header was pushed away for a corner. Coventry City: Billson, Whitmore, Fixter, L Rowe, B Rowe, White, N’Gandu, Hunt (Lautaru 53), Crowther, J Burroughs, Bapaga. Subs not used: Martin, Tyler, Lafferty, G Burroughs. Cardiff City: Ratcliffe, C Davies, Margetson, Reynolds, Bagan, King (Andrew-Knott 86), Mayembe, Bowen (capt), Evans, Ligendza (Colwill 76). Subs not used: Parsons, Duffey, J Davies.